A new proof-of-concept TSN conformance testing tool enables systems designers the chance to see how their devices and networks perform in real-world settings, before they are being rolled out as products. The goal is to create a faster process towards an open, interoperable ecosystem of devices. THE INDUSTRIAL INTERNET OF THINGS (IIoT) is among one of the biggest business opportunities of the 21st century and recent market reports and projections see the industrial automation equipment market as a central focus for that growth. Central to this growth are the networks that relay more and more data from an increasing number and variety of devices. Consequently, there is a need for greater scalability through the convergence of different types of traffic onto a single network infrastructure and the assurance of interoperability at this larger scale. There is a need for greater reliability and interoperability across the network to ensure the timely transfer of information to systems with increasingly complex needs. This includes time synchronization that needs to be managed within tenths of a nanosecond in some specific environments. 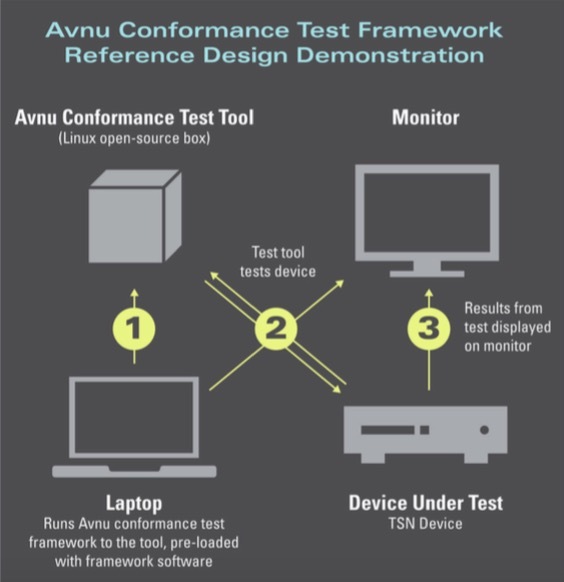 How the new Avnu proof-of-concept TSN conformance testing tool works in practice. Leading industrial and transportation companies will demand the same high levels of reliability, security and safety for their control systems within the IoT as is provided today by a multitude of specialized but often proprietary and segregated communication technologies; but these requirements with regards to reliability and security must be addressed in a much more connected and open infrastructure, leading to challenges in deployment and diagnosis not seen before in this type of system. Deterministic Ethernet-based networking with IEEE Time Sensitive Networking (TSN) fills an important gap in standard networking. In particular, it offers guaranteed latency and delivery for critical traffic whilst allowing other traffic types on the same wire. It allows for IIoT to incorporate high-performance and latency-sensitive applications in a converged, robust network infrastructure. In the industrial context, the IEEE/IEC 60802 joint working group has taken on the important task to define an industrial automation profile based on the IEEE TSN standards. Avnu Alliance builds upon the work of these standardization bodies and ensures that all the ecosystem players implement TSN in an interoperable manner by providing conformance test plans and test procedures. Upfront testing of a new technology′s capabilities is key to understanding the path towards a successful network deployment. Testbeds offer systems designers the chance to see how their devices and networks perform in real-world settings, before they are being rolled out as products. The Industrial Internet Consortium (IIC) is one group working with leading vendors and manufacturers in industrial automation to help ensure that a network of TSN devices work together appropriately. As the world′s first testbed for Time Sensitive Networking, the IIC′s TSN for Flexible Manufacturing testbed was developed with two major goals in mind: to show TSN′s readiness to accelerate the marketplace and to highlight the business value of adopting open, interoperable standards in automation networks. The role of Avnu Alliance in the TSN certification ecosystem, including testing, standards and specifications. While testbeds and plugfests help test for a certain degree of interoperability and allow companies to create real-world systems as an early check for potential problems, conformance testing systematically ensures both alignment with the standards and interoperability of devices in real-life settings. Based on industry-accepted requirements for TSN network interoperability, Avnu Alliance develops test plans for conformance to ensure interoperability at the network layer. Starting with Time Synchronization, or 802.1AS as the foundation for all TSN devices, Avnu released the first set of test plans at SPS IPC Drives in 2017 and continues to work on extending these plans to other TSN standards. The goal is to develop baseline test plans for the industrial market which ensure that end devices, infrastructure components and silicon conform to the relevant IEEE and IEC standards. Avnu leverages the above mentioned IIC Testbed by evaluating the developed test plans and procedures early on with testbed participants such as Analog Devices, Belden/ Hirschmann, Bosch Rexroth, Cisco, General Electric, National Instruments, Schneider Electric, and TTTech - many of whom are also Avnu Alliance members. As the wide adoption of TSN has led to the emergence of other testbeds for TSN devices - including Labs Network Industrie 4.0 (LNI) and Edge Computing Consortium (ECC, in liaison with Avnu) - Avnu aims to share its test plans with more TSN testbeds as a concerted effort towards "One TSN" network. At the 2018 SPS-IPC Drives, Avnu participated alongside ISW University Stuttgart and IIC in a joint-booth, showcasing Avnu′s role in the TSN ecosystem including a demonstration of a new proof-of-concept conformance testing tool, an automated Linux-Based Test Tool for Compliance Testing of 802.1AS to streamline conformance testing and certification of TSN devices. The test framework will interface with a variety of test equipment from low cost to high-performance and it will provide a consistent user interface and results report that can be utilized by end vendors as well as testbeds, test houses and protocol groups to conduct in-house conformance testing of TSN devices. This test framework reduces total testing process time and enables easier testing for vendors, both in-house and at testbeds, to provide test result details and allow for device debugging and problem-solving before products go to market. All of the above aim to ensure interoperability at the foundational network layer 2 with TSN. Many organizations, such as OPC Foundation and the various fieldbus organizations, have developed application layer protocols, which are well suited to work on top of TSN. OPC UA over TSN, supported by the OPC Foundation, is a prominent example and Avnu Alliance also intends to make its TSN test plans available to application layer protocol organizations who wish to test their protocols on top of TSN. The goal is to offer device manufacturers a one-stop-shop for certification of the entire stack and to impose no restrictions on the choice of test houses. Together, this work across the industry and among various standards groups, protocol organizations and industry leaders will create a faster process towards an open, interoperable ecosystem of devices that take advantage of Time-Sensitive Networking′s full benefits. Organizations like Avnu Alliance build upon the work of these standardization bodies and ensures that all the ecosystem players implement TSN in an interoperable manner by providing conformance test plans and test procedures. Technology report by Avnu Alliance Industrial Segment.